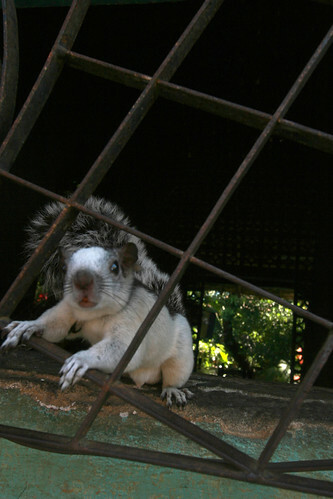 Once numbering close to 1,000, the rare white squirrels of Olney, Illinois, are on the decline. 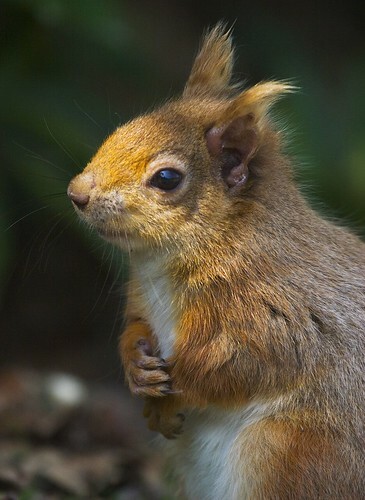 A recent proliferation of white squirrels are causing quite a sensation in upstate New York. See: An Omen, a Mascot — and Quite a Sensation. Locals are thrilled, quickly naming them Al Bino, Alby and Snowflake. One local college made Alby a pseudo-mascot. It’s fitting considering all the snow they get up there. Unfortunately, Alby has gone to squirrel heaven. And Al has possibly disappeared (white squirrels are perfect prey for red-tailed hawks, who hone in one them from hundreds of yards away. In a forest, white flashes of scampering are probably easy for anyone to see. Which is why white squirrels remain rare in temperate climates) and has been replaced by a more “French vanilla” squirrel now named Junior. “For Michael Kelly, 55, who counts himself a blood brother of the Seneca-Cayuga American Indian tribe, the first encounter (with Snowflake, apparently still alive) was striking. He said the tribe considers white animals a good omen. Rabid squirrel, originally uploaded by frostybrandx. Just yesterday I blogged about the abundance of squirrels living on college campuses, who become so accustomed to the students that they lose all fear of humans, and end up becoming more like pets, or sometimes, nuisances. 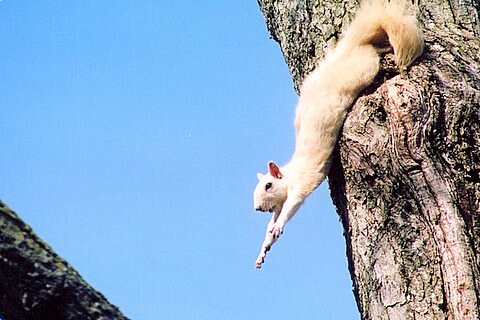 A campus environment is so safe that even albino squirrels can thrive. Normally, these guys don’t last very long, since they are easy for predators to spot. But on a college campus, the hustle and bustle of humans everywhere prevents predators from swooping in and plucking away the genetic mutants. In this excellent, hilarious-yet-sad story from The Lantern, the reporter retells the final moments of Whitey, a beloved squirrel on the campus of Ohio State University. A red hawk flew down, caught and killed Whitey, and then preceded to eat him while a swarm of students watch, some even taking pictures. There’s a photo included, which really tells it all. 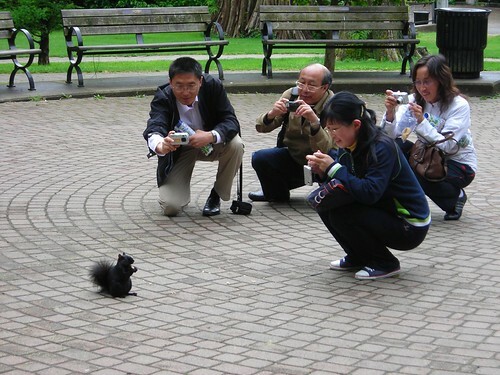 When I first moved to New York from Texas, I was shocked to learn that squirrels aren’t just grey!